A quote from Horace‘s classical lyrics lends this work its title, building a poetic bridge between tradition and today with an adage of timeless validity. «Carpe diem». «Use the day» and enjoy the present but reflect, too, on the past and on responsibility toward the future, one wants to add, immediately dismissing this moralizing appeal so as not to spoil the elegant playful lightness of this work by any overbearing advice. 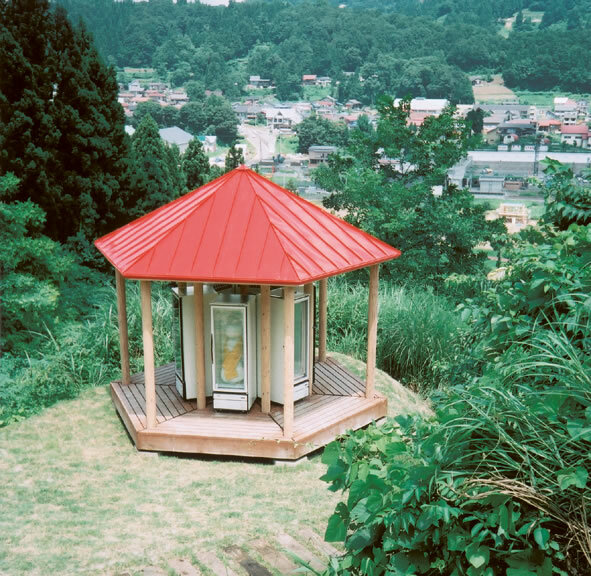 Above the city of Matsudai an idyllic little pavilion stands amid a natural setting... Carried by twelve round posts, this is a hexagonal, centrally planned building with a slightly elevated, podium-like wooden floor. It is open and can be entered from every side... the romantic architectural motif of the European pleasure pavilion of the 18th and 19th centuries comes to mind as well as allusions to mountain huts, look-out platforms, outdoor stages, dollhouses, children‘s merry-go-rounds and even small temples. 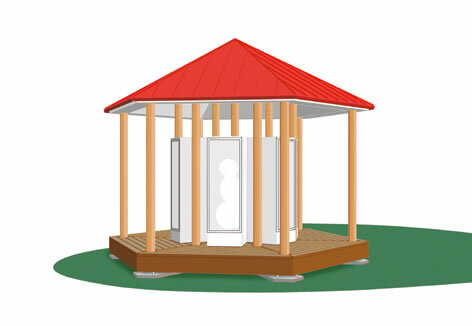 According to season, this pavilion is either empty or “inhabited” Six commercial, human-sized deep freezers are grouped around the middle of the building. In summer (in up to 35° outdoor temperature), each of these contains a snowman, locked into an air-conditioned glass house (-25°) and exhibited as if in a show window. The six short-lived figures are individually designed and lovingly provided with attributes (hat, scarf, etc.). 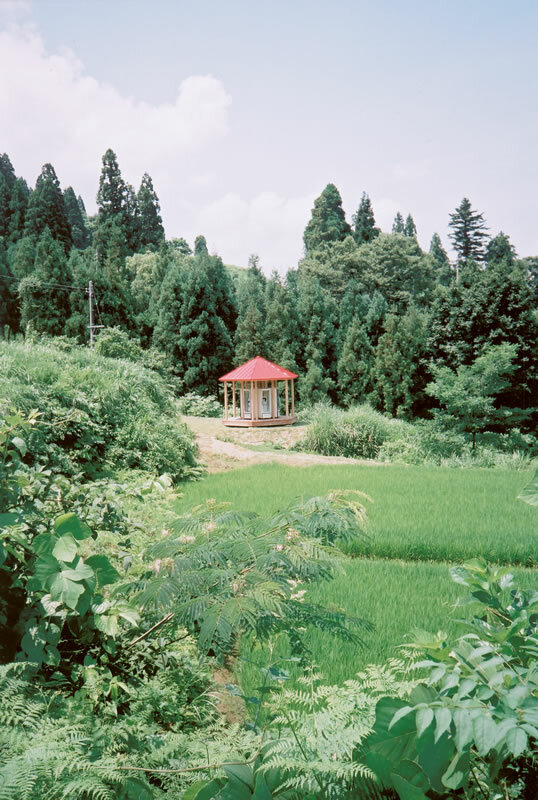 They represent three different generations: grandparents, parents, and two children – the members of a traditional Japanese family in the country, a family which is, in fact, no longer self-evident in this ideal form since the migration of the younger generation has changed social structure. The artwork unites nature, industry, and society in that it comments on factors and characteristics present in the region. In an area with the heaviest snowfall in the world, snow, as an element central to life, is one of these factors. The snow family is pre-prepared every winter by children of the region according to their own ideas and conserved in a deep freeze storage house. 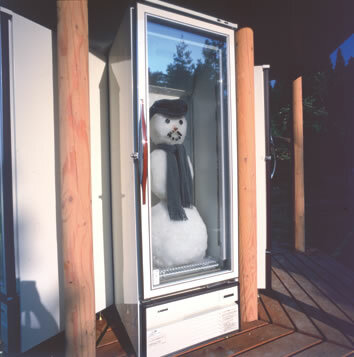 In summer, the snowmen are moved to their home in the pavilion‘s freezers where they are exhibited - virtually transposed in time - from July to August. Whoever wants to visit them can climb up to the pavilion and circulate between the two rows of columns inhabited by the very familiar and yet so surprisingly out-of-place cult figures... At the end of the intervention, the dream drips away. The doors are opened, the snow again melts into the earth, and the cycle of nature closes. The empty freezers are taken away in order to create a space that visitors can use as they wish for the rest of the year. The pavilion can be a meeting point, a place for drawing into oneself and contemplation, or the goal of an excursion until summer returns and, with it, the welcome guests from another time who once again move in. Construction drawing in 3-D model (BERG-Architekten, Zurich). Bird's eye view with view over the city of Matsudei-Town. Detail: freezer with snowman made by 11-year-old boy. Concrete foundation, wooden construction in Japanese pine, 13 wooden columns, metal roof red, teak floor, 6 freezers with 6 three-part snowmen each, various scarves, caps, buttons, carrots, etc., electrical installation.